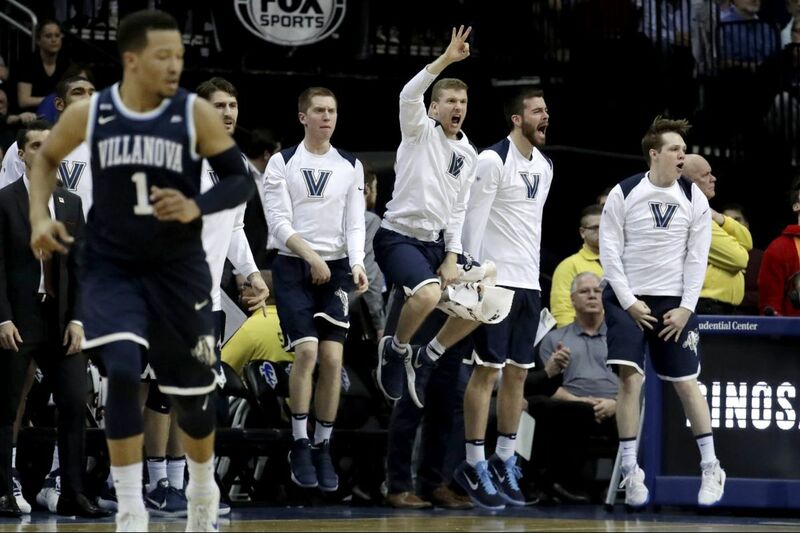 Villanova players react after a basket against Seton Hall during the second half . NEWARK, N.J. — Jay Wright called it "a Big East rock fight," and he was pretty much dead-on given all the bricks that caromed off the rims and backboards at the Prudential Center. Fourth-ranked Villanova and Seton Hall didn't exactly put on an offensive clinic Wednesday night. The Wildcats had trouble making three-pointers, hitting just eight in 36 tries, and Jalen Brunson struggled with his shot for much of the game. The Pirates missed 16 consecutive shots at one point. But looking at it from Wright's point of view, the defenses controlled the night not just for 40 minutes, but also for an extra five. It took Brunson's late scoring, including six points in overtime, for the Cats to get out safely into the Newark night with a 69-68 victory. The victory, which kept alive Villanova's streak of not having suffered back-to-back losses since the end of the 2012-13 season, a run that stands at 176 games, enabled the Wildcats (26-4, 13-4) to stay one game behind Xavier in the Big East with one game to play. A win by the Musketeers on Saturday over DePaul would give them the regular-season championship and the top seed in next week's Big East tournament. But as for Wednesday, the Wildcats were just happy to win. "That was a Big East rock fight, man," Wright said. "Nobody can make a shot, some good, tough defense. I would rather not have played in a game like that, but we needed to play in a game like that where we just couldn't make shots and our defense kept us in it. I was proud of our guys that way." Villanova shot just 36.4 percent from the field in the game, and the Pirates finished at 38.5 percent. Mikal Bridges led Villanova with 23 points and 10 rebounds, and Omari Spellman neutralized Seton Hall's Angel Delgado and pulled down 14 rebounds compared to eight for Delgado, the Big East leader in that department. Seton Hall forward Sandro Mamukelashvili, left, scores a basket against Villanova forward Omari Spellman during the second half. But Brunson, who failed to record an assist for the first time since the 2016 national championship game, wound up saving the day, rounding into form late after a 1-for-9 start. He scored 12 of his 14 points in the last four minutes of regulation and in overtime. "My teammates have confidence in me at all times. So does my coach and so do I," Brunson said. "I keep the same cool, just not really worry about what happened in the past, keep moving on." "That's just a sign of a great player," Wright said. "He's not afraid to fail. He loves having the pressure on him, on his shoulders. That's what the great ones do. That was vintage Jalen Brunson, just no fear of failure." The Wildcats needed every point at the end. A 17-foot jumper by Brunson followed by two free throws from Donte DiVincenzo gave the visitors what seemed to be a safe 66-59 lead with 25.5 seconds remaining. But Eron Gordon hit a second-chance three-point basket, and Villanova was unable to get the ball inbounds, leading to a five-second violation. Myles Powell followed with a layup that made it 66-64 but missed the ensuing free throw. Spellman made 1 of 2 from the line and Khadeen Carrington followed with a dunk, cutting the Cats' lead to one with 6.8 seconds left. Gordon then looked to steal an inbounds pass but officials detected him holding Brunson, who made two free throws. Carrington was deliberately fouled on the Pirates' next possession, made the first free throw and then accidentally hit the second, a shot he banked in as he tried to miss. When Villanova successfully inbounded the ball, the game was over. "It was good just for us, playing tough," Bridges said. "We haven't been playing tough in a long time, playing together. So playing hard together and tough is a good thing, and we're going to keep building from this, go to practice tomorrow and get ready for Saturday." The Wildcats will close the regular season Saturday against Georgetown at the Wells Fargo Center.